You guys, HAPPY DOWN SYNDROME AWARENESS MONTH! In our family, we choose to celebrate the heck out of DS every single day. But this month is a great time for everyone, effected/blessed directly by DS or not, to celebrate! Look at the beautiful littles below and tell me their joy, beauty, individuality, and all around wonderfulness doesn't deserve some "hip-hip-hooray"ing. Am I right?! I decided that this time every year, we'll invite all these buddies (maybe one of them even being Welles' future wife!? ;) ) to do a little photo-shoot so we can look back as they grow. Let's be honest though, this little shoot was not easy. There was a handful of mommies hopping around like monkeys trying to keep their attention and snag some good smiles. 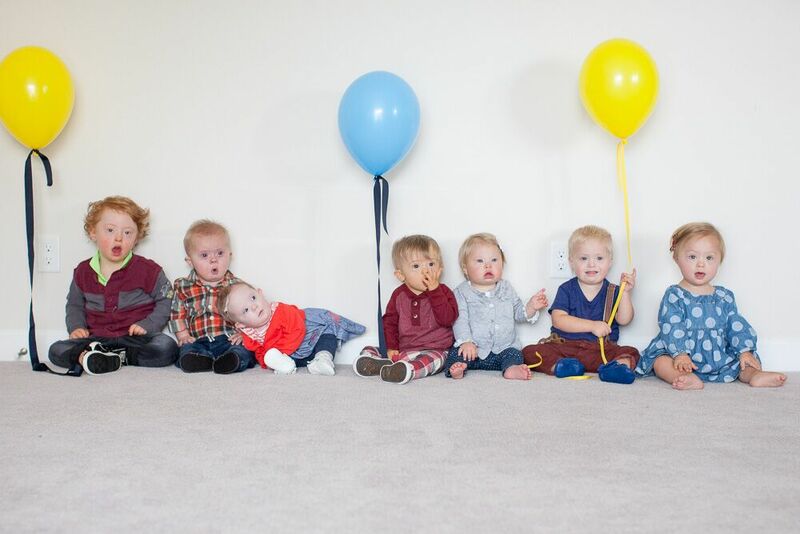 While the kids pictured below all seem to be a bit more mellow and content than your average toddlers, they still each have unique personalities and characteristics. This is why it drives me nuts when medical professionals and many average Joe's lump kids with DS in to one category as if they're all the same. During this picture-taking play date, some were happily interacting, some preferred keep to themselves, some were chasing each other down for kisses and whops on the head, some were nervous about all the commotion/noise and others were falling asleep while the chaos was blasting around them. Just like "typical kids," these guys have differing personality types. They have different levels of learning in all the different categories. They'll excel at different paces and in different areas than each other. They'll have different interests, different fears, different passions and different ideals. They will each be perfectly awesome in their own different ways. And I love every single one of these squishy little people. I had each mommy write out a quick little something about what their baby has taught them, shown them or what they've enjoyed about them in this past year. You'll love reading and you'll surely drool over these fabulous shots by Tessa's mommy, AKA Cassi. Eddy's unbridled enthusiasm has been the hallmark of this year. He reminds us that happiness is finding great joy in the small and seemingly commonplace things. Whether it's his grandpa, eggs or bath time... You can't celebrate enough. He walks in the room, everyone starts smiling and eventually he has us all laughing. We don't want to imagine a world without him. Strider has brought more joy to our family and others around us than we could have ever imagined. He has taught us to love more, be humble, laugh more and enjoy the little things in life. If we have learned all of this in the first seventeen months of his life, we can't wait to see how he will help us grow in the years to come! Everywhere we go Ella has the ability to light people up. Whether she is smiling or serious, laughing or crying, she radiates pure joy and love. We feel so blessed to have this little light as a part of our family. She reminds us of all that is good and important in life. When I think about what the last year has been like getting to know Hannah, the thing that sticks out most is Hannah's spirit being so full of sunshine! She is the happiest, most content little person. Her smiles and soft giggle light up the room. She has been such a wonderful addition to our family and is a constant reminder that despite the tough circumstances we run into in our lives, there is always so much to smile about. Bennett, in just the first year of life, has taught our family to love because of a person's differences, and not in spite of them. Bennett's, and his friends', physical features, mannerisms, etc. 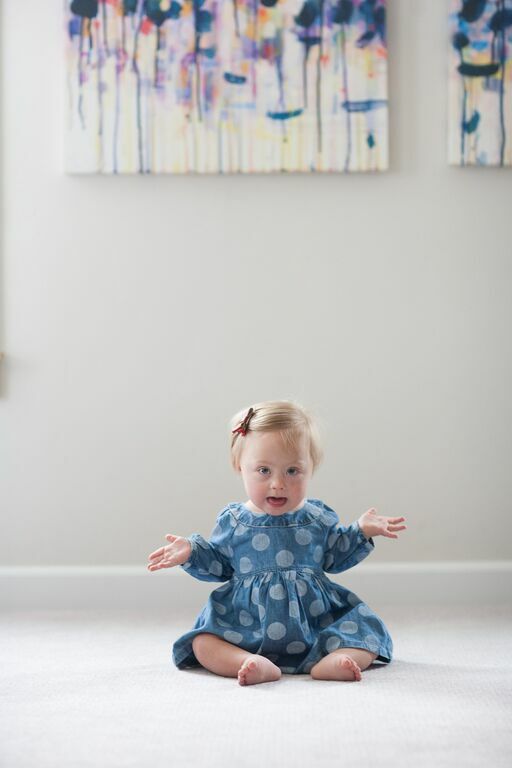 that are common to those with Down Syndrome might have been strange to us or made us uncomfortable in the past, but are now adorable to us, remind us of their angelic nature, and draw us to them. Sweet Tessa Mae has only been in our family for eight short months but has already made a huge impact on us all. She has made us braver and closer. Tessa has taught us that the meaning of "perfect" comes in so many different forms, and because of her, we see the world differently. Life is richer, sweeter and more meaningful. Tessa has already far exceeded what I first thought life would be like with a baby who has Down Syndrome. Turns out she's just another bouncing babe with a bald head and set of sparkling blues who cries and giggles and grabs our faces for slobbery kisses. Our family feels whole with Tessa in it and I wouldn't change a thing about her. We can't wait to see what life has in store for our girl.